Their story began a few years back when founder, Ronny Thompson, relocated to Atlanta in pursuit of a job opportunity. 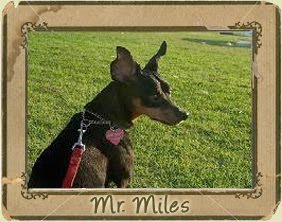 At the time, he was living in a studio apartment with his dog Cesar in the heart of Atlanta. Ron strongly believed in the importance of providing Cesar the best diet possible. After filling his bowl with premium dog food then filling his water bowl with ordinary tap water that smelled like chlorine and tasted like chemicals, it didn’t make much sense. While doing a little research, he learned the chemicals found in tap water may cause your dog serious health issues including liver or kidney damage and even increase risk of cancer. This ultimately inspired Ron to create the first commercially available all natural vitamin beverage for dogs. Initially he met with leading canine and nutrition experts regarding the benefits of premium ingredients for optimal nutrition. 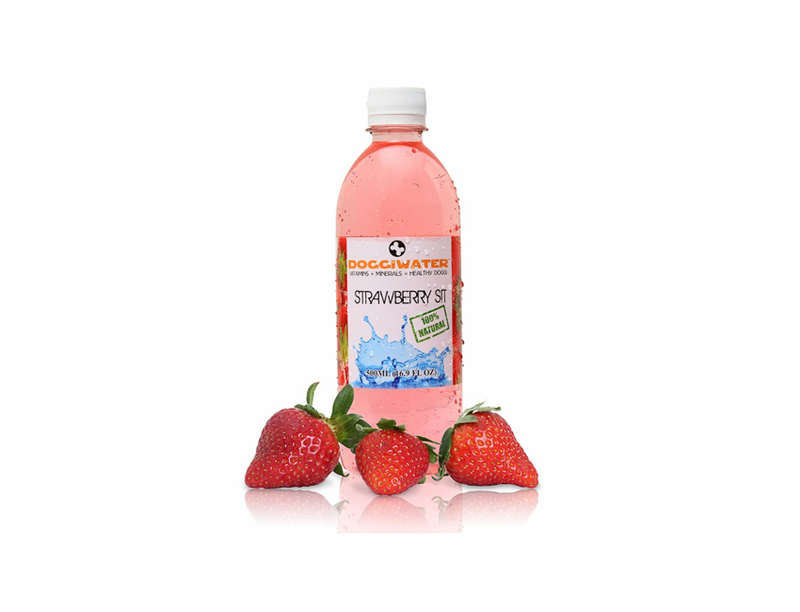 His goal was to create a premium beverage that not only eliminated contaminants but also included substantial nutritional benefit to support a healthy balanced diet. After speaking with recommended holistic veterinarians and top selected breeders, a unique combination of real organic fruit and ultra purified water was formulated and Doggiwater™ was created. The vitamins and minerals in Doggiwater™ allow dogs to enjoy the benefits of superior nutrition while reducing their exposure to harmful chemicals. Our dogs aren’t just pets, they are family. If you want the best for them the choice is simple, choose Doggiwater™ the elite standard of dog nutrition. At Doggiwater, we believe proper nutrition is the foundation for a healthy lifestyle. Our philosophy is based on using only the highest quality ingredients in developing the best product possible. 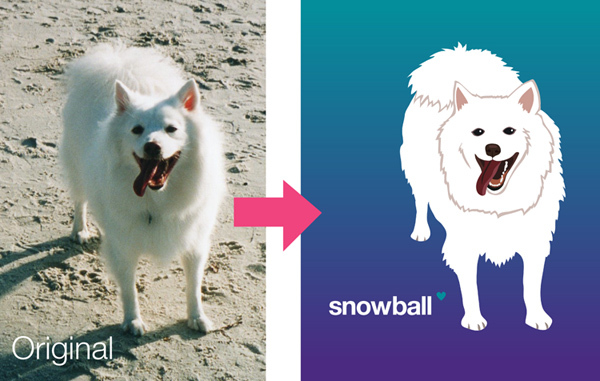 Over the years, we’ve made it our mission to offer a natural, healthy, and delicious alternative in dog nutrition. We are just like you, we love our dogs, plain and simple! If we wouldn’t drink it, we wouldn’t give it to our dogs. We are passionately picky when selecting nature’s finest ingredients and never compromise quality. Our team of dedicated animal lovers and experienced nutritionists strive to provide dogs a balanced diet with the healthy lifestyle they deserve. With every 12-pack you purchase, Doggiwater™ will donate a new dog bowl to a local animal shelter allowing a dog in need to enjoy the benefits of proper nutrition. It feels good to give back! After reading about this new company, we have to say it really peaked our interest. 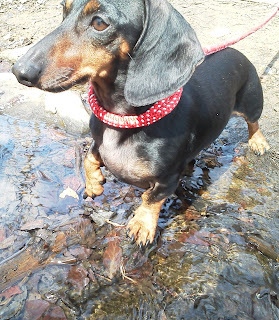 After all, we do feed our dog organic grain free dog food ...but we had never thought about the water we give them. Since we drink filtered water, shouldn't they? We love the thought and research behind the concept and it that it gave us something to really think about. What we always love most are companies that give back to the animals and community. This product is definitely worth trying! Here we are introducing another awesome new designer! Apryl, the creator of Bija Collars. Don't forget to check her website for more great designs! 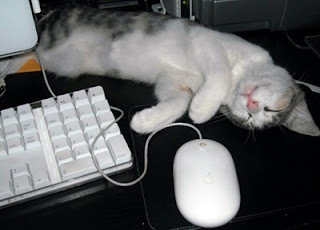 Did we mention that a portion of sales benefit animals? Another reason we love Bija Collars. 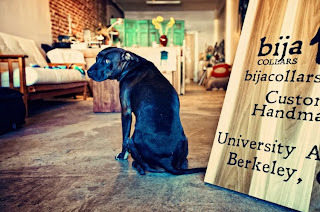 Bija, an ancient Sanskrit word meaning "seed", is a fitting name for the little chocolate brown pit bull who is the inspiration behind Bija Collars. In 2008, Bija was dumped at the local marina with large puncture wounds on her head and bite wounds over her body. Unfortunately, her story is not unique... it is a story that is way too common. The term Bija is a metaphor for the origin, beginning, or root from which all arises. We began learning, crafting, and refining the skill of making leather dog collars in 2009 not knowing exactly where it would take us. We have grown into small company composed of two dogs and one woman... Bija, Bodie, and Apryl. We live in Berkeley, CA near our University Ave workshop. 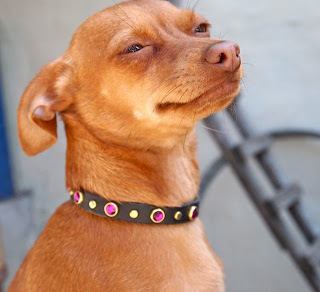 We create custom hand crafted collars, leashes, and belts with a primary focus on dog collars. Our collars are strong and are designed to be worn on a daily basis. We select the highest quality hardware... stainless steel and solid brass. We don't really use patterns and have developed the hand eye skill to do most of our work without them. This means each collar is made with the utmost concentration and a whole lot of our blood, sweat, and tears. We enjoy our work and always keep in mind the beautiful doggie soul who will wear it. You may choose one of our designs or a custom design. We have a tendency toward non conformity and we love to think out of the box... let us know your ideas and we will work with you to create a totally unique collar for your one of a kind pooch! Driven by our respect for animals and our committment to homeless, abused, exploited, and neglected dogs, we are active members of the local east bay dog community. We love all dogs yet we are particularly devoted to bully breeds as they are one of the most abused, neglected, and misunderstood of dogs. We hope our business will help bully owners educate the community about the beauty, loyalty, love, and affection that is a pit bull. 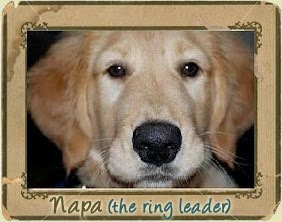 10% of our sales go to local non profits dog rescue groups. 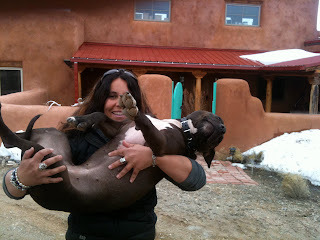 Get to Know Megh and Kurt - Designers of the K-Leash! 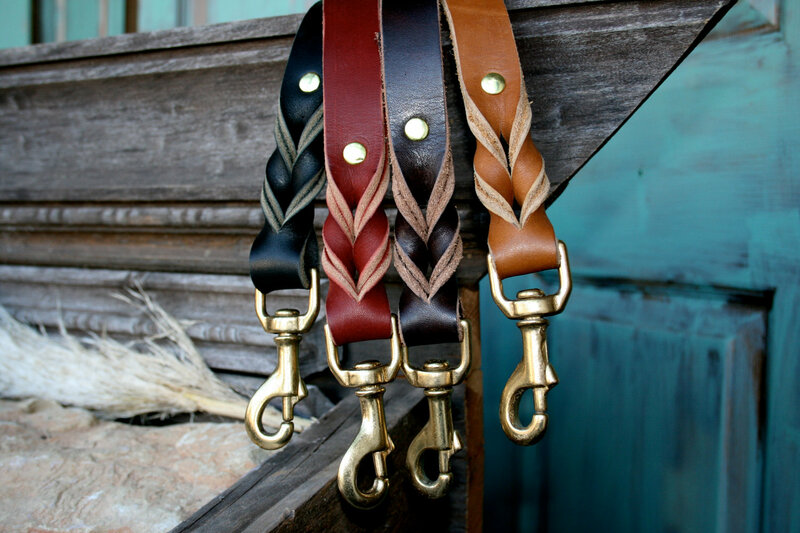 The K-Leash www.thek-leash.com is one of our featured new designers for a reason! 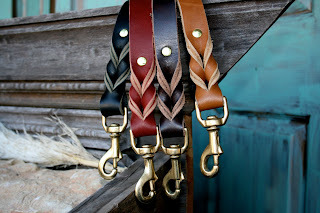 Not only are their collar/leash combos great for traveling and keeping in the car for spur of the moment stops with your pup....but they are also durable, unique, AND environmentally friendly! Does it get any better than that?? PLUS we love the look and the amazing color options! They also have an Etsy Shop and the K-Leash is ONLY $19.99. The People Behind the Business: Last summer on an afternoon drive through the south fork of Long Island, Megh and Kurt of the K-Leash stopped at a beach bar outside Montauk.With them was Bustar, their best friend and miniature dachshund. As an avid beach enthusiast Bustar expressed an interest in joining them (waggy tail) but they neglected to bring along his leash. What they did have was some scrap sailing rope and a set of splicing tools. That afternoon in the driver's seat of their car two simple splices were built into a length of red sailing rope and the ﬁrst K-Leash had arrived. Since then they added several new K-Leash models using similar concepts. ABOUT THE K-LEASH: The K-leash is a modern rendition of the martingale collar. It is hand spliced rope custom fit to the width or your dog's neck. The eye splice adjusts to a larger loop to slip over your dog's head. It is placed around the dog's neck and with a simple slide of the hand adjusts to a custom secure fit for your canine. When your pup tries to pull his or her head out of the collar, the tension on The K-leash pulls the eye splice taut preventing escape. 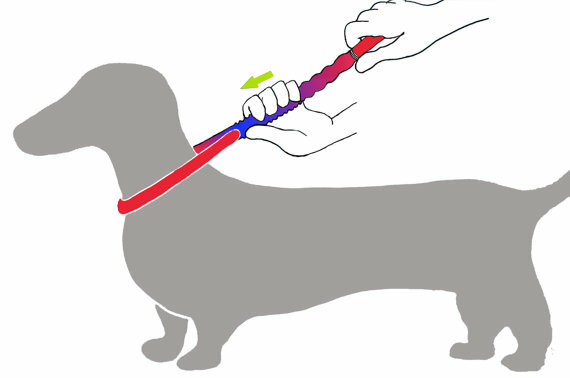 When adjusted properly the dog is never choked, but the eye splice collar stays snug around your dog's neck. The K-leash is made from recycled sailboat line. This line is an anti-abrasive cover made to withstand the toughest loads and harshest seas and often sells for $10+ per foot. We found we had piles of expensive extra rope too short for any boat and two feisty pups who like to escape and chew through everything. So, we decided to use our creative splicing skills, save some money, and re-use all those left over rope ends. Now we want to share our design with you and your pup. We can guarantee your dog will have no chance destroying this line. It's also safe enough for the laundry, it's colorful, and it's custom made! MEASURING: To measure for The K-Leash, find a soft tape measure or a piece of string. Measure at point A, B, and C in the drawing shown. Provide us with a message stating A,B,AND C, to ensure that your K-leash fits. 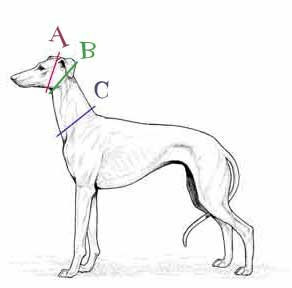 For some Pups their measurements at points A & B may be the same or close. Choose the measurement that is large enough to slip over the head (point A) but not too large to fit correctly at point B. In other words, choose the smallest size that will still fit your dog. If your dog has a 15 inch neck we will design your K-leash to adjust from 13-18 inches. Get to Know Kathy Kuhl of Nelli Designs! 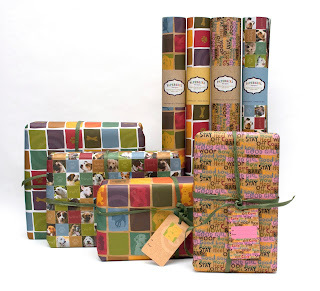 Nelli Designs was inspired by the passing of Kathy Kuhl’s first dog, Maggie, and the subsequent adoption of a rescue dog named Nelli in 2008. Searching for a meaningful and personal memorial for Maggie, Kathy made herself a candle as a placeholder for Maggie’s old pet tags. Three years later, Kathy and Nelli are hand-pouring each candle with EcoSoya tm Natural Wax, a clean burning wax with your choice of Unscented, or better, Rolling in Grass, to remind us of those dog days of summer. Each candle is personalized with a leather or grograin ribbon collar of your choice, as well as tags engraved with inspirational, heart warming and sometimes humorous quote about our lives with our poochie pals. They are the perfect gift for any pet lover, any occasion. Nelli Designs candles were created to honor all pets everywhere that have taught all of us how to love. But, more importantly, how to love again. We will be doing a giveaway of one of her amazing candles on Facebook tomorrow 2/8/2012, so check our FB Page for details on how to win! Get to know Carolyn Clingman of Papergirl Designs! Carolyn's experience spans over 25 years in the graphic design field. She has worked in design studios, ad agencies, in-house firms and freelanced. During that time she received numerous awards and developed an extensive design portfolio. In addition, she dabbled in jewelry and mosaic design. When she's not chasing her 7 year old daughter around, watching baseball with her husband or playing fetch with their dog, she can be found in her studio designing more exciting ideas for Papergirl Designs! 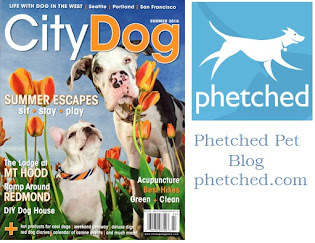 We recently began featuring several new pet businesses on our website, and wanted to share information about each business and the designers behind them. 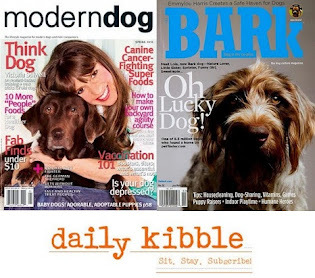 People ask me all the time about pet products we sell or promote, and I thought it was important to tell the stories behind these wonderful businesses and their creations. Who are the designers, what is their inspiration, and why are their designs so incredible?! Well, we are going to tell you. 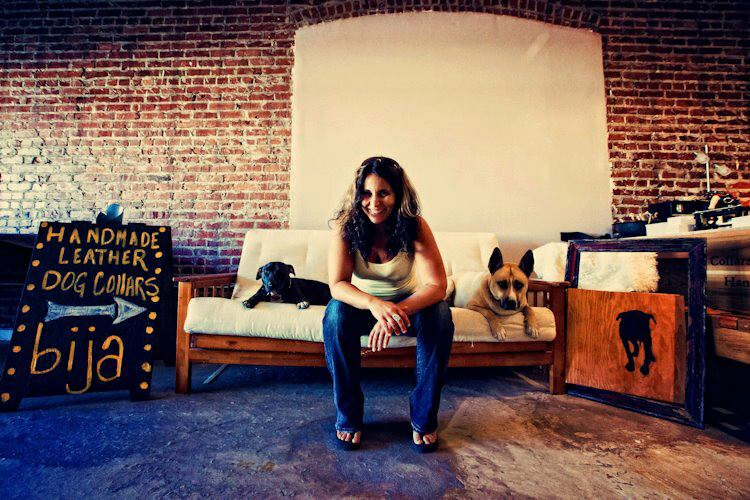 Erin is a Los Angeles based Graphic Artist, who has always had a great love for animals. As an owner of 2 cats (Harlow and Bogie, inspired by a couple of her favorite classic hollywood icons, Jean Harlow and Humphrey Bogart), a dog foster, and animal rescue volunteer/advocate, it brings her joy to have the opportunity to combine her passion for animals with her career. She enjoys creating modern, fun portraits that capture the attitude of each pet and make their owners smile for years to come. 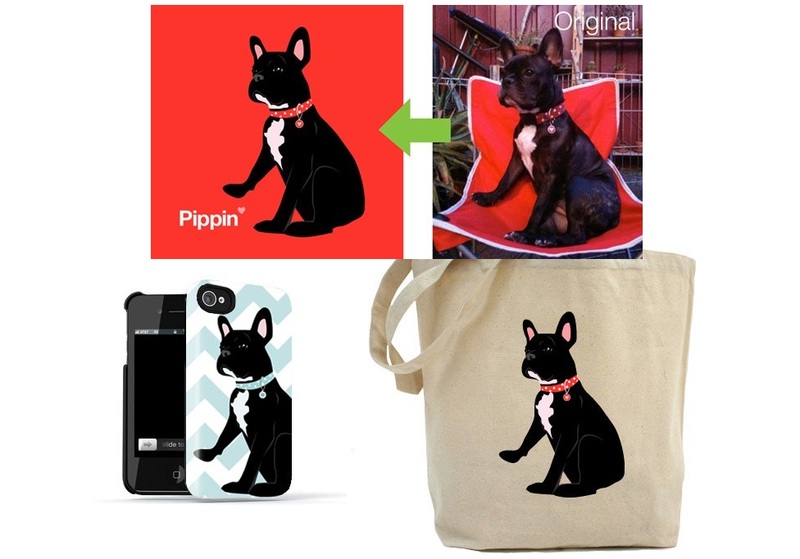 She runs an Etsy shop dedicated to creating modern, custom portraits of your lovable pets. 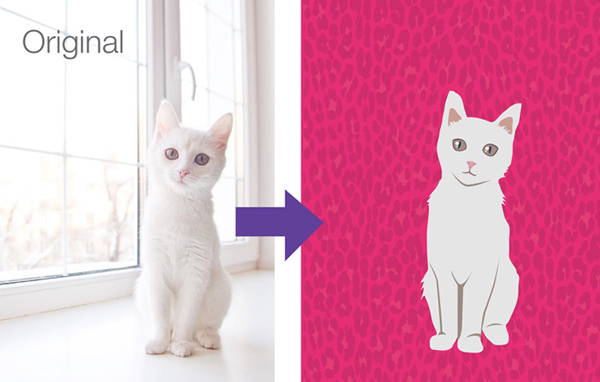 Just send in a photo of your pet, choose from a large selection of colors and background prints, and she will design a portrait of your best friend. You can also have the portraits printed on a variety of different gifts, from notebooks to dog bowls to pillows. 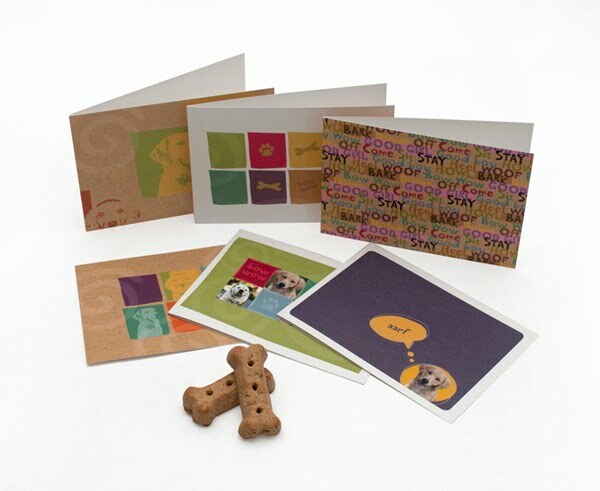 These make great gifts for animal lovers; and with the holidays approaching, she even offers holiday cards featuring your pet! 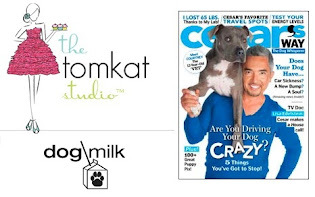 See us on the TomKat Studios Holiday Gift Guide! 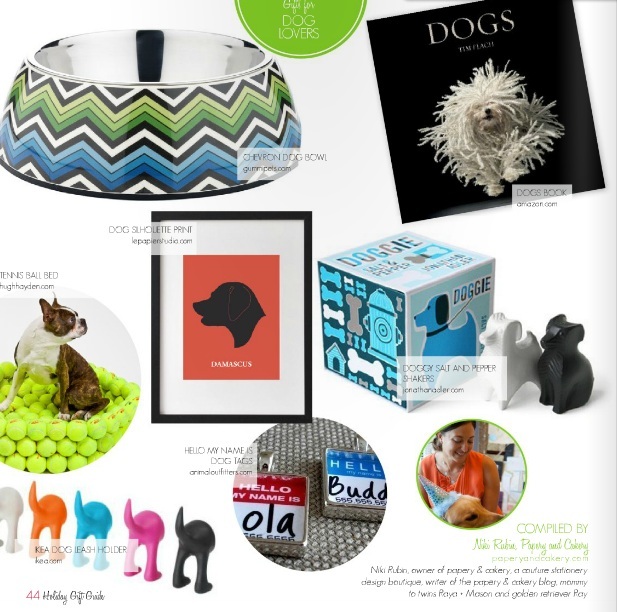 Check us out on 2011 TomKat Studio Holiday Gift Guide! 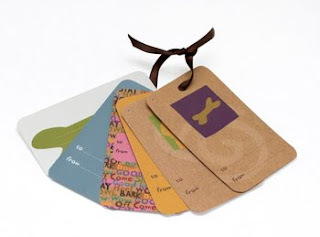 Our personalized Graphic ID Tags have been featured in this incredible gift guide, you HAVE to check out the rest of this guide for some amazing finds. I found things I have never seen before and I am IN LOVE with this. What's even better, as you flip through the pages of the guide you can click on the images you like and it takes you direct to the online shop where you can buy it. Shopping doesn't get any better!! 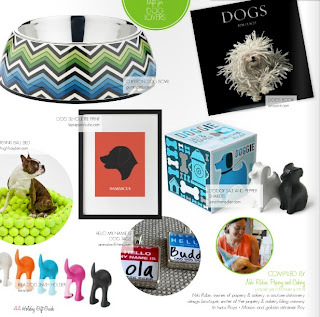 Great stuff for pets, babies, house decor, family, and YOU. © Copyright Animal Outfitters Blog. All rights reserved.